Yesterday marked the 2-month countdown to Christmas and I have to say that it surprised me a little. Normally we’ve had at least a dusting of snow or very chilly weather, but this fall has been quite tolerable. I noticed while backing out of my driveway the other day that some of the shrubs I have in my front yard have burgundy foliage for the first time ever. I guess that’s what they’re supposed to look like when frost doesn’t take them prematurely in September. You may think I’m crazy to be thinking about Christmas already, but I’ve learned from the past that I enjoy the season far more when I’m prepared. There is something every year that I wish I’d done sooner or had more time to do. I’m sure there will still be a few mishaps and ‘oh-my-gosh’ moments this year, but I’m hoping the planning will keep them to a minimum. Every week leading up to Christmas, I’ll let you know what I’m doing to stay on track. I’ll also share any holiday DIY projects, tips or finds. Make sure you come back to see what I’m up to! Also, I’d love to know what you’re doing to prepare, so leave a comment or send me a message. Two heads (or 3 or 4…) are better than one! Plant amaryllis and paper white bulbs. Most bulbs take at least 8 weeks to bloom. If you plant them now, they’ll be ready for Christmas. I like to watch mine transform as the weeks go by to remind me that something special is coming. 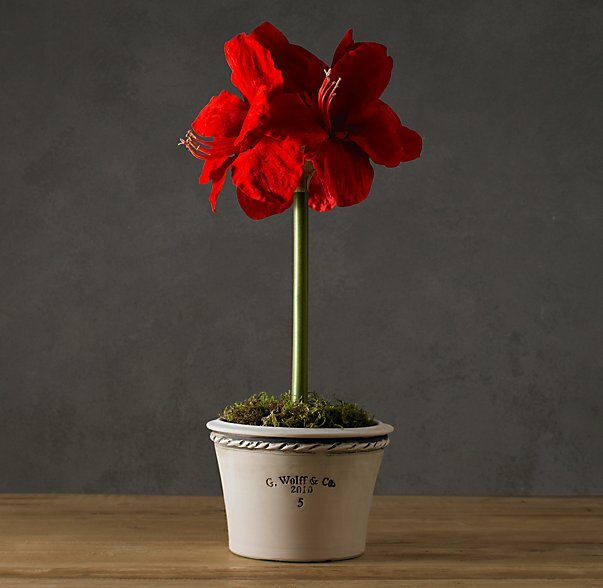 I have a fairly neutral space and the pop of red from the potted amaryllis adds color and interest. Put up your outdoor lights. I’m not suggesting that you turn them on yet, but who wants to wait until there’s a foot of snow on the ground and it’s minus twenty to put them up? I also find that if you need new strings of lights, the selection is always the best right now. Apparently last year there was a shortage because many were recalled. Look for something unique to add to the mix. Take photos for your holiday cards. I’m not saying that slapping a random family photo from your summer camping trip on the front of your card is a big No-No. However, wouldn’t you rather send out something that truly represents your family and you’re proud of? If you’re that kind of kickback family and it’s meant to be relaxed or somewhat humorous in nature, that’s different- go for it! If that isn’t the look you’re going for, get professional photos done or ask a friend to take some for you. It probably isn’t necessary to mention the imminent weather, but the likelihood of you traipsing through the woods picking up pinecones and branches is almost nil once the snow flies. Go this week and take the kids with you. Natural materials are some of the best decorations and they’re free! Winterize the yard and house. It’s something that’s pushed to the bottom of the list, but needs to be done. I know, the joys of being a homeowner! If you haven’t changed your furnace filter or had it serviced in the past 2 years, it’s the perfect time to get it done. Clean off your outdoor furniture and bring it inside or make sure it’s at least covered. As well, turn off your outdoor water tap and put the hoses away. If you’re in a very cold climate (like me), empty the dirt out of your clay pots and wrap delicate shrubs with burlap. What are you going to do this week to prepare for the upcoming holiday season? Do you take it day by day or do you have it carefully planned out? Let me know about your best-kept secrets for surviving the frenzy. I love reading your posts Shauna! I will be checking in with you for all your tips and ideas about the holiday season. Thanks Kerri. I’m looking forward to hearing about what you’re doing to get ready for Christmas! Oh no, don’t tell me that. Such a pretty site, thanks for your visit! Better to be prepared, right? Thanks for the kind comments. Your site is beautiful as well. Hi Shauna, this is a great idea for post. I think you are very wise to get started on the Holiday prep!! I just told my hubby I wanted him to take down our Christmas boxes so I can purge before Christmas instead of during or after decorating. I am not sure it is going to happen, but I did mention it. Hi Kathysue, thanks for visiting my site. I appreciate comments and enjoy reading each and every one of them. Hopefully your husband will be on board with purging before the holiday frenzy. This week I will be talking about deciding on a holiday decorating scheme and much more. Holiday countdown week 2 post will be on Monday. Come back and check it out!